Meanwhile, in the other spooky old haunted house of the American imagination, 999 restless spirits were settling into their new digs on the opposite coast. This is the week that Disneyland opened the Haunted Mansion, a long-awaited E-ticket attraction that invites theme park guests to tour a post-mortem retirement home for the corporeally liberated. This is the old house, abandoned by the family after the dark and terrible tragedies of the distant past, now left available for whatever ghouls care to move in and set up housekeeping. I wonder if Quentin knows about this one? To be honest, the Haunted Mansion has nothing to do with Dark Shadows, but I love Disneyland, and there’s no way I’m going to ignore the other spook sensation of ’69. Now, the Mansion may have opened its doors three years into Dark Shadows’ run, but the idea of a haunted house at Disneyland goes back to 1957, a couple years after the park opened in Anaheim, California. In the early days of Disneyland, there was an area called Magnolia Park, sort of a transitional space along the Rivers of America between Adventureland and Frontierland. Walt Disney decided to build up this zone into its own themed land, New Orleans Square, which would include restaurants, shops and a haunted house. Excited by the idea, they included New Orleans Square on the official Disneyland maps in 1958, with a haunted house in the middle. Unfortunately, they didn’t really have a good plan for what to do with a haunted house attraction. Also, they didn’t end up putting New Orleans Square there. They were making things up as they went along, and sometimes the maps had bloopers. 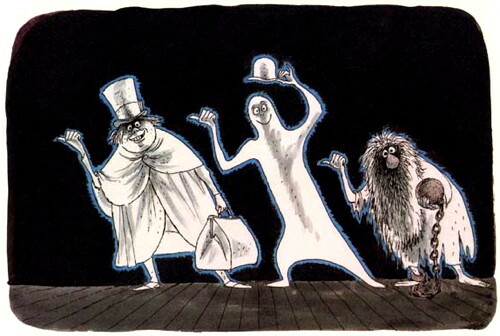 The original idea for the haunted house was a guided walk-through attraction, with a butler leading a group of guests through the mansion, where things would get progressively scarier until the guests were hastily ushered out through a secret panel. There were a bunch of early treatments, and most of them involved a murdered bride and the ghost of a wicked sea captain. It was always about ghosts, right from the start; they never considered a Dark Shadows-style mix of vampires, werewolves and witches. They probably thought of that as a cheap Halloween experience, the kind of thing that anyone could put together for a carnival. Disneyland’s ghost house was going to be open year round, and it needed to tell a coherent story. But they couldn’t make the story work. The Imagineers mocked up dozens of promising special effects, but it didn’t come together. One problem was that the walking tour seemed like a hassle — you’d have to get all of the guests into the room, close the door, do the effects, and then get them all out of the room before you could bring in the next group. One frightened kid having a meltdown would hold everyone up. The project was put on hold at the end of 1959. By 1961, plans for the Haunted Mansion were back on the table. Magnolia Park had been taken over by an expansion of the Jungle Cruise, but they built New Orleans Square a little further down the river. They started building the mansion exterior in 1962, and announced that the attraction would be open by 1963 — but they still couldn’t agree on the story. The most promising idea was for the tour group to be led by a disembodied Ghost Host, who told the story of a bride and her fiancee murdered in the house before the wedding. 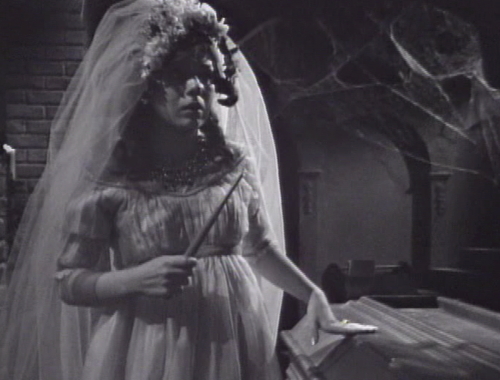 At the end of the walk-through, the Ghost Host would appear in person, revealing that he was the killer, who hung himself in the attic after murdering the couple. Or it was something like that. They went through a lot of versions. Besides, the walk-through idea was still a problem. They finished the facade in ’63, but the doors wouldn’t creak open for another six years. By the late 60s, increasing crowd capacity was a major concern at Disneyland. They opened Pirates of the Caribbean in 1967, and it was a huge success — a clever story, spectacular visuals, state of the art animatronics, plus they could literally send boatloads of people through the ride. 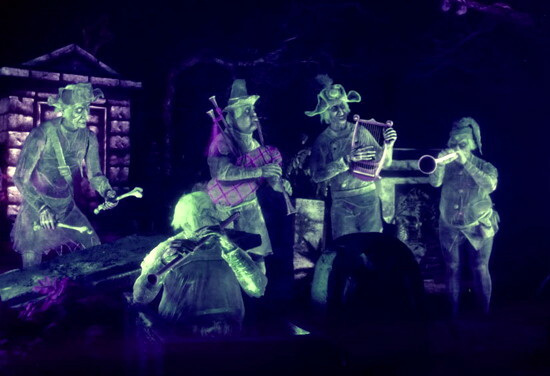 If they were finally going to open the Haunted Mansion, then it needed to be a “people-eater” like Pirates, and a walking tour wasn’t going to cut it. The answer turned out to be a new ride system called the Omnimover, which they’d just developed for another 1967 attraction, Adventure Thru Inner Space. This Tomorrowland attraction shrunk guests down to the size of an atom, and took them on a trip through the molecules of a snowflake. To achieve the illusion, the Imagineers needed to direct the guests’ attention to precisely the right place as they moved through the show. The Omnimovers run on a constantly-moving endless loop, and the individual cars are programmed to swivel and tilt so that the guests are always looking where they’re supposed to be. 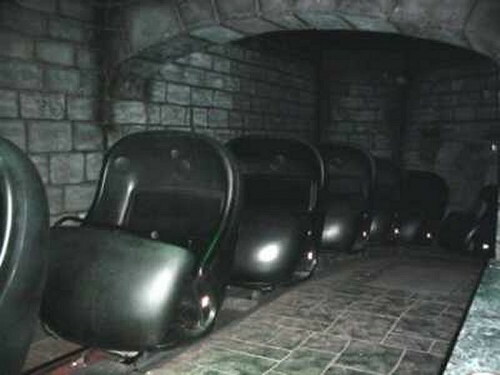 At the Haunted Mansion, the Omnimover cars were nicknamed “Doombuggies,” and the constant flow along the track turned the attraction into the people-eater they needed. The final Haunted Mansion ride is a collaboration between two lead designers — animator Marc Davis and background artist Claude Coats, who had just wrapped Pirates of the Caribbean. But they couldn’t agree on the attraction’s tone — Davis wanted a funny attraction with lots of gags and characters, while Coats wanted to make it a scary ride, traveling through a spooky environment. Coats was the Ron Sproat to Davis’ Sam Hall, so to speak, except that Coats was good at his job. Scriptwriter X Atencio ended up settling the argument by splitting the attraction into two parts. The first half is Coats, and Davis owns the second half. The attraction begins with a clever trick. The Mansion itself is just the entrance — the ride is too big to fit in that facade, so the actual show building is hidden on the other side of the railroad tracks. When you enter the Mansion, you’re shown into a parlor decorated with four portraits of the family members who once lived in the house. As you watch, the portraits stretch — and reveal the gruesome fates of the unhappy family. The trick is that the roof isn’t rising — the platform that you’re standing on is descending, taking you underground. Then you walk along the portrait gallery — which takes you under the railroad tracks — and board the Doombuggies, which carry you into the show building. 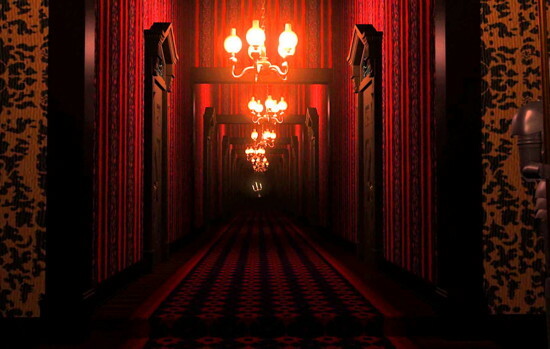 The first half of the show is Claude Coats’ spooky version — traveling through dark, sinister hallways. The doorknobs are rattling, something is trying to break out and get at you. The grandfather clock is striking thirteen, and looks like it might fall on you. Even the wallpaper is glaring at you. Once you pass Madame Leota’s seance circle, the ghosts come out to play — and that’s Marc Davis’ half of the attraction, filled with funny ghost characters and sight gags. You pass through a Grand Hall full of partying spirits, then travel up into the attic and out the window, into a backyard graveyard where the happy haunts sing their endless anthem, “Grim Grinning Ghosts”. The interesting thing about Marc Davis’ ghosts is that they’re super pleased to be dead — they’re not tormented spirits lamenting their fates. 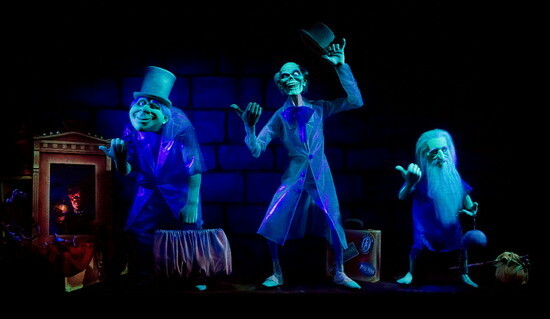 They’re happy haunts, grinning ghosts. Dying is the best thing that ever happened to these people. The feeling is infectious — as soon as you get off, you want to go through and ride it again. 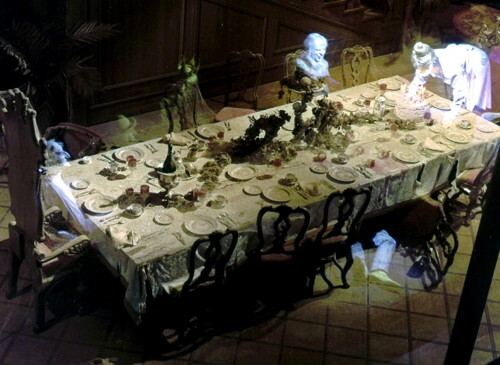 And like all the best Disney theme park attractions, the Haunted Mansion is designed to be a repeatable experience. There’s way more going on than you could possibly see on one trip, which means that every ride is different, and no matter how many times you’ve been there, you might see something that you’ve never noticed before. So what does all this have to do with our vampire soap opera? Well, the Haunted Mansion and Dark Shadows are both asking the same question: how do you tell a scary story in a way that people will eagerly want to come back to, again and again? And they both solved that problem in pretty much the same way: by doing a lot of different things at once. 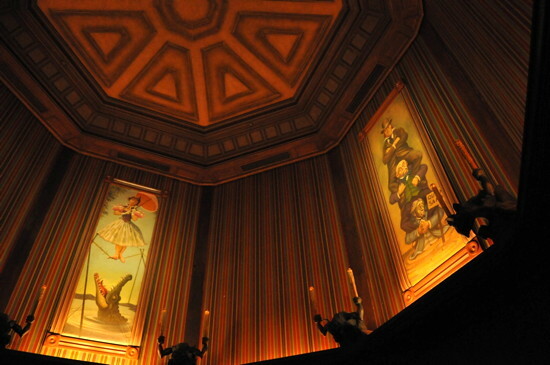 Like Dark Shadows, the Haunted Mansion isn’t the product of one genius auteur, who designed it from start to finish. Over more than ten years, dozens of people contributed to the attraction that finally opened its doors in the summer of ’69. There were bold plans, blind alleys and happy accidents, and they figured it out as they went along. Oh, and there might be a little bit of Dark Shadows in the Mansion after all. 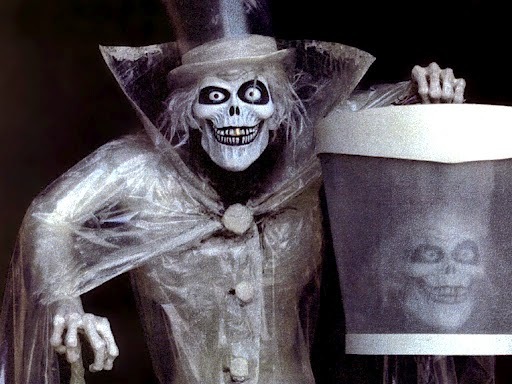 There’s a really smart blog about the Haunted Mansion called Long-Forgotten, which makes a well-researched and plausible argument that the transformation of Josette’s portrait in episode 405 may have inspired one of the changing pictures in the Haunted Mansion’s portrait gallery. The dates match up, too. Maybe sometime after April Third, Josette’s restless spirit managed to find a new home in New Orleans Square. Stranger things have happened. Who knows? Maybe they’re still happening. If you want to learn more about Disneyland’s Haunted Mansion and its counterparts in Florida, Paris, Tokyo and Hong Kong, there’s a great book you should check out: The Haunted Mansion: Imagineering a Disney Classic, by Jason Surrell. At the beginning of act 2, Aristede rubs his palm and then his fingers on his knife, the Dancing Girl. If it was sharp at all, he’d cut himself. When Tim and Petofi talk about Aristede, Tim steps on Petofi’s line. Nora reminds Jamison that Tim and Charity “never got along very well” — but they were engaged, the whole time that Nora knew Tim. This episode was skipped when it aired in syndication on public TV stations in the 1980s. The video master was missing, and the syndication company, Worldvision, didn’t realize that there was a black-and-white kinescope available. The kinescope copy was found when Dark Shadows was licensed to MPI for home video release in 1989. There are just two more kinescope episodes left in the series — episodes 1006 and 1017. And of course, the Haunted Mansion’s cemetary has a caretaker. No dialogue given to him, but apart from his visibly shaking in terror, you know he’d be upset that the dead aren’t resting and are partying instead. That every time through is different and you see something new each time, this is another similarity with Dark Shadows and is one reason why the show works so well on home video. You’re always seeing other nuances each time you view a given show. Plus the fact that in the Dark Shadows theme park there are over 1,200 rides, and the scenery is always changing, never really staying the same for long. In fact, it would be great if someone could design a Collinsport theme park. You’d have an Old House and the new Collinwood and maybe Eagle Hill cemetery and the Collins mausoleum and a few other locations all done to scale, though not as a series of disjointed sets that could be crammed together in a small studio that looks like a bowling alley, but with real exteriors as well. And, of course, after all that Collinsport sightseeing, you’d need to cap it off by stopping in at the diner of the Collinsport Inn for cheeseburgers and coffee. Speaking of which, in episode 813 it’s good to see the diner set for the Collinsport Inn back, which is what we’d expect since Tim is after all staying at the Collinsport Inn. Though, I don’t know, the place just isn’t the same without Maggie Evans behind the counter and Burke Devlin around to ruffle people’s feathers. And, in 1897, it probably didn’t even have cheeseburgers on the menu, since that particular item didn’t become popular until the 1920s. Oh yeah, true. As well, real Coca-Cola. Alright, where did I put my I Ching wands? The mayonnaise is probably just as deadly as it is in 1966, though. Collinwood folks come out to exorcize. Long-Forgotten is one of my other favorite blogs; nice to see a shout out here! I’ve always felt like stepping into the Haunted Mansion, especially the Florida version with its New England Gothic architecture, was like walking into a life-sized Collinwood. The dueling portraits in the Haunted Mansion’s Great Hall always make me think of Barnabas and Joshua, their portraits facing each other across Collingwood’s drawing room for 200 years as if the duel never ended. Since the attraction end of the show or in development at the same time, I can only imagine that they were both tapping into some aspect of the zeitgeist people just really felt a psychplogical need for at the moment. 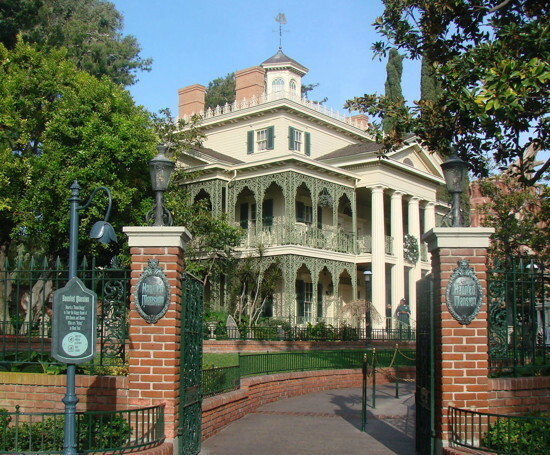 Disneyland’s Haunted Mansion opened on August 9, 1969. The same day the Manson murder’s happened. As a huge Haunted Mansion fan, I’m now wondering if the orchestral, dirge-like opening of “Grim Grinning Ghosts” wasn’t slightly inspired by the Dark Shadows theme. Oh, and while it’s not as good as a Collinsport theme park, I did hear the DS theme when I first entered the Halloween section of Holiday World theme park in Santa Claus, IN about a month ago! Going back to Disney World in October, and I’ll definitely be thinking of DS more as I enter the Haunted Mansion! Okay, alright. Briscoe gets zero points for actor skills – the DS Wiki for this episode made mention of Amanda being killed in this show, so I rewatched to find out. (She’s not dead; I changed the wiki.) That scene with Tim questioning Amanda about her attacker was just plain awful; like Briscoe was reading the scene ‘cold’ off the teleprompter, and just using Acting 101 class techniques. Terrible. Good thing he’s so cute (despite that dreadful hairstyle). And good thing that Donna McKechnie is pretty, too – the scene is better with the sound off! No chemistry, no dramatic value – just pretty to look at, like wax figures.